I took the day off of work to take my husband to the airport. I was very pregnant and fighting to appear stronger than I was. I wondered if anyone walking past us while we hugged had any idea that I was saying “see you later” to my best friend…and that I wouldn’t see him for the next 6 months. Or that a few weeks later I would be welcoming our son into the world. Without his dad to hold him. I thought about work. I thought about my coworkers and how I knew I wouldn’t be able to keep it together if they asked questions like, “Are you nervous about giving birth without your husband?” Or if they said things like, “Don’t worry; it’ll go by quickly.” While I knew they meant well, I was also flooded with hormones and was ready to cry. I started my maternity leave that day. I didn’t know (until after my first Family Day) that there were band members in the military. And that was their actual job. I didn’t realize how much personnel members are actually in charge of and how vital their role is. I had no idea that Honor Guard refers to service men and women who carry the flags… and also the coffins. More and more, I’m realizing how misunderstood the military system is. People are quick to ask if someone has killed or if they have PTSD before they even ask where they are from. Before they get to know them. Because those men and women are more than just service members. They are someone’s child. They are a sibling; they are a spouse. They may even be a parent. At times, civilians may even assume that every soldier is on the front lines or that those who work desk jobs aren’t real heroes. Social media insinuates that military members are gun-wielding killing machines and forgets that these brave men and women are trained to defend our country so that the rest of our country is able to go home to their family at night. Even if it means they don’t. As a military spouse, I can tell you all the strange things I’ve been asked or the comments people have made to me. At first, I just couldn’t understand why people would feel comfortable saying such things. Like suggesting that the military pays all our bills (that’s not really how housing allowance works) or that we asked for this by falling in love with a service member; that we knew what we were getting into. But I started to realize that they simply didn’t understand. They have never been in a situation that prevents them from seeing or even speaking to their spouse over a long period of time. They haven’t experienced not knowing where their loved one is or if they are ok. They likely have never even met a service member or a military spouse. And that’s ok.
More than anything, service members, veterans, and spouses just want to be treated like anyone else. We don’t mind questions, we are excited to share our experiences! I am so beyond proud of my spouse every single day. Any opportunity to talk about him or our kids is one that I never pass. 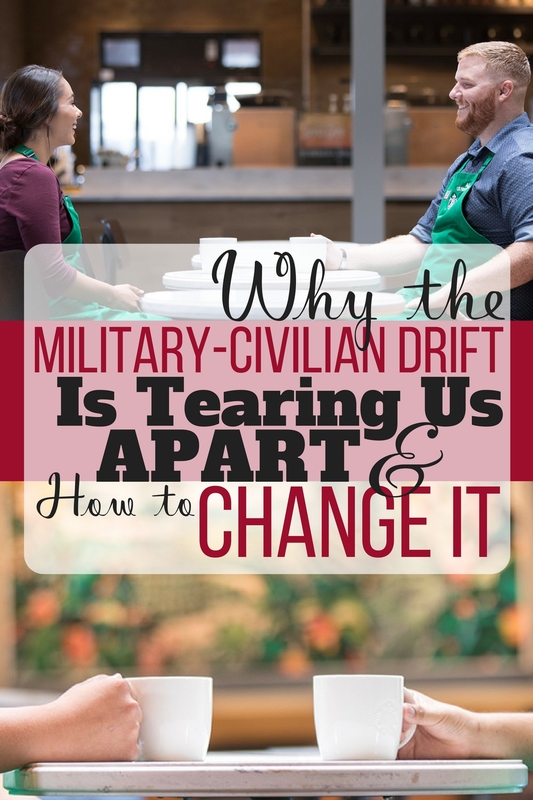 Starbucks has made it their mission to bridge the civilian-military divide. They are committed to hiring veterans and military spouses and also educating civilians about how to engage in a meaningful way. More companies need to be doing this, and I’m hopeful that someday they will. I’m hopeful one that one day this positivity will outshine the negative shadow that social media has cast on military families. I’m hopeful that civilians and military families will be able to better understand each other and connect in a more uplifting way. I am hopeful that we can once again come together as one nation and support each other by lifting each other up, instead of tearing each other down.